If you've saved a template or imported an HTML file to the Saved Templates page in your account, you can export an HTML file of that template to your computer. You can use this file to edit the HTML code of the template, or upload the template to a different Mailchimp account. In this article, you'll learn how to export a template from your account. Locate the template you'd like to export by browsing the template list or using the search option. Click the drop-down menu next to the Edit button for the template you want to download and choose Export as HTML. If you're exporting a saved drag-and-drop template, a warning appears before the template can be exported. Exported drag-and-drop templates will not include the drag-and-drop functionality in their code. 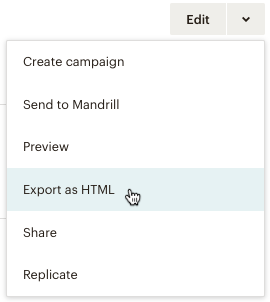 When imported into a Mailchimp account, drag-and-drop templates can be used to create and send campaigns, but will not be editable in Mailchimp. If you want to retain the drag-and-drop functionality for a template, look into using our template sharing feature. After clicking the Got It, Export Template button, the template downloads to your computer as an HTML file. You'll now be able to edit the template outside of Mailchimp in your preferred HTML editor. The exported template can also be imported into another Mailchimp account to be used for campaigns. With the Share feature, you can share your email templates with other accounts. Get tips for sending and receiving templates in Mailchimp. With Mailchimp's template language, you can code an email template right from your account. Learn how to add template images and find your template's HTML.